In 1900, Cesare Isotta and Vincenzo Fraschini formed Isotta Fraschini (IF) in Milan, Italy. The firm originally imported automobiles, but began manufacturing its own vehicles by 1904. 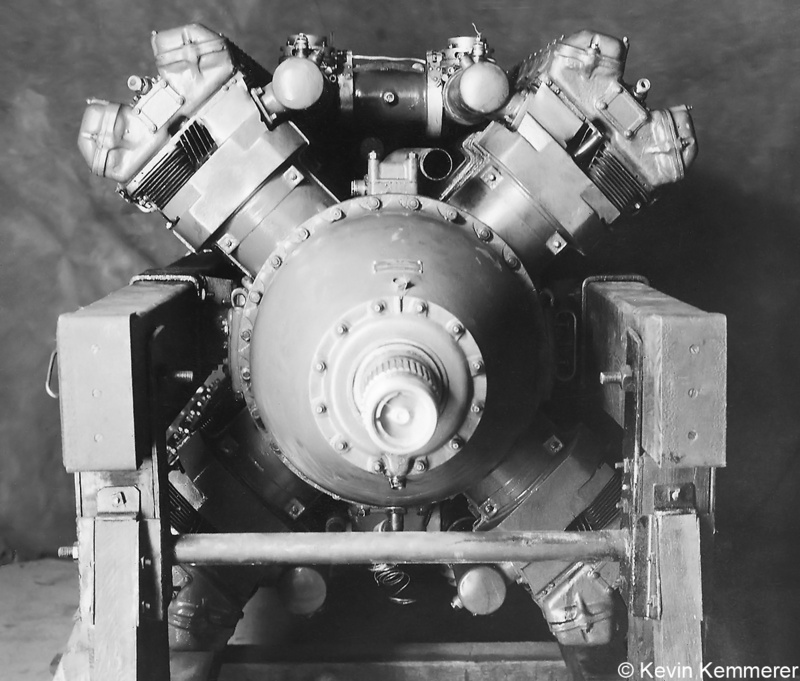 In 1908, IF started experimenting with aircraft engines and began producing them by 1911. The company went on to build successful lines of air-cooled and water-cooled engines. In the early 1930s, IF experienced financial issues caused in part by the great depression. In 1932, the Italian aircraft manufacturer Caproni purchased IF and continued production of automobiles and engines (both aircraft and marine). In the late 1930s, IF developed a pair of inverted, 60 degree, V-12, air-cooled engines. The first of the engines was the Gamma. The Gamma had a 4.92 in (125 mm) bore and a 5.12 in (130 mm) stroke. The engine displaced 1,168 cu in (19.1 L) and produced 542 hp (404 kW) at 2,600 rpm. The second engine was the Delta; it had the same architecture as the Gamma but had a larger bore and stroke of 5.20 in (132 mm) and 6.30 in (160 mm) respectively. The Delta displaced 1,603 cu in (26.3 L) and produced 790 hp (589 kW) at 2,500 rpm. In 1939, the Ministero dell’Aeronautica (Italian Air Ministry) worked to import Daimler-Benz aircraft engines from Germany and obtain licenses for their production. IF decided to design an engine powerful enough to compete with the Daimler-Benz engines or replace them if sufficient quantities could not be imported. To speed engine development, IF created the new engine using as much existing technology as possible. Essentially, two Gamma engines were mounted on a common crankcase in an X configuration to create the new engine, which was called the Zeta. 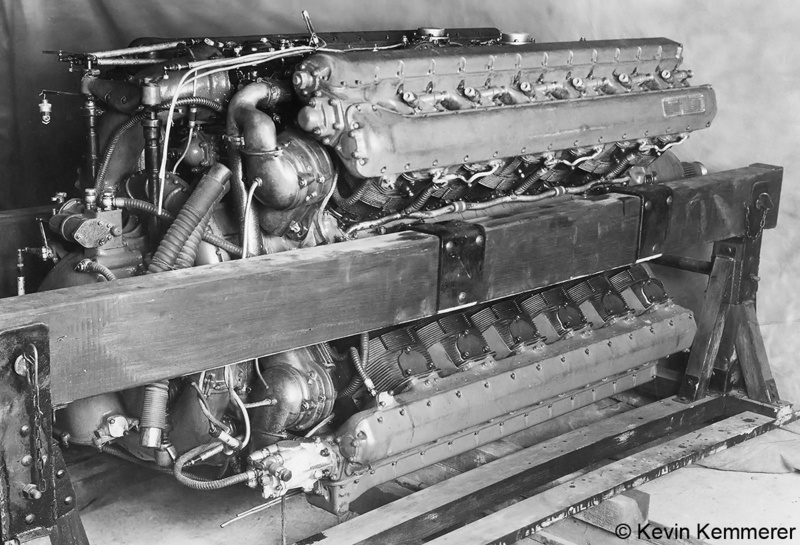 The use of air-cooling and a single crankshaft simplified the design of the 24-cylinder Zeta engine. The Isotta Fraschini Zeta was made up of an aluminum crankcase with four cylinder banks, each with six individual cylinders. All cylinder banks were positioned 90 degrees from one another. Each air-cooled cylinder was secured to the crankcase by ten bolts, and the cylinder’s steel liner extended into the crankcase. Each cylinder had two spark plugs that were fired by magnetos positioned at the rear of the cylinder bank. Each cylinder had one intake and one exhaust valve. Mounted to the top of each bank of cylinders was a camshaft housing that contained dual overhead camshafts. A vertical shaft at the rear of the cylinder bank directly drove the exhaust camshaft. A short cross shaft drove the intake camshaft from the exhaust camshaft. The crankshaft was supported by seven plain bearings, and each connecting rod served four cylinders via a master rod and three articulating rods. An accessory section at the rear of the engine drove the magnetos, vertical drives for the camshafts, and a single-stage supercharger. The supercharger forced air through intake manifolds between the upper and lower cylinder Vees. The exhaust gases were expelled from the cylinders via individual stacks between the left and right cylinder Vees. A pressurized air starting system was used, and the engine had a compression ratio of 6.5 to 1. The Zeta maintained the 4.92 in (125 mm) bore and 5.12 in (130 mm) stroke of the Gamma. The Zeta displaced 2,336 cu in (38.3 L) and produced 1,233 hp (919 kW) at 2,700 rpm. The engine was around 68 in (1.73 m) long, and 39 in (1.00 m) wide and tall. The Zeta weighed approximately 1,675 lb (760 kg). The Caproni Vizzola F.6MZ was the only aircraft to fly with a Zeta engine. The close-fitting cowl can be seen bulging around the engine’s cylinder banks, and the removed panels show just how tight of a fit the cowling was. 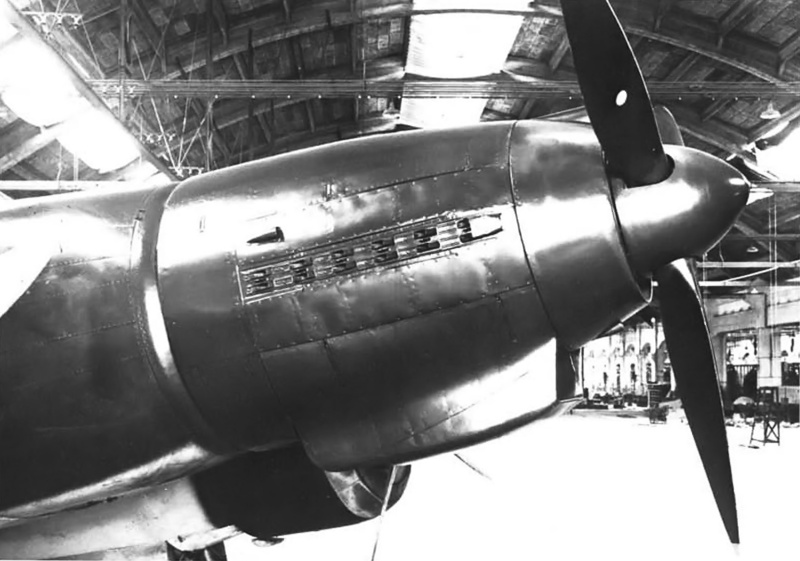 Note the gap around the propeller for cooling air. The Zeta RC45 was first run on 28 February 1941, and development was slowed due to various design issues. The engine was also having trouble making the forecasted output, with only around 1,085 hp (809 kW) being achieved. As development progressed, many of the issues were resolved, but the engine still lacked power. In May 1943, the Zeta RC24/60 with a two-speed supercharger was run, but the engine was not able to pass its type test. A number of aircraft were considered for conversion from their initial engines to the Zeta, but serious progress was made on only two aircraft. The Caproni Vizzola F.6M was an all-metal aircraft based on the Caproni Vizzola F.5 but powered by a 1,475 hp (1,100 kW), liquid-cooled, Daimler-Benz DB 605 engine. While the F.6M was being developed, the design of a second version of the aircraft powered by a Zeta RC45 engine was initiated on 7 October 1941. The new design was called F.6MZ (or just F.6Z). The Zeta-powered aircraft was ordered on 16 June 1942, and it was assigned serial number (Matricola Militare) MM.498. The engine change came about because reliable deliveries of the DB 605 and its license-built contemporary, the FIAT RA 1050, could not be assured. 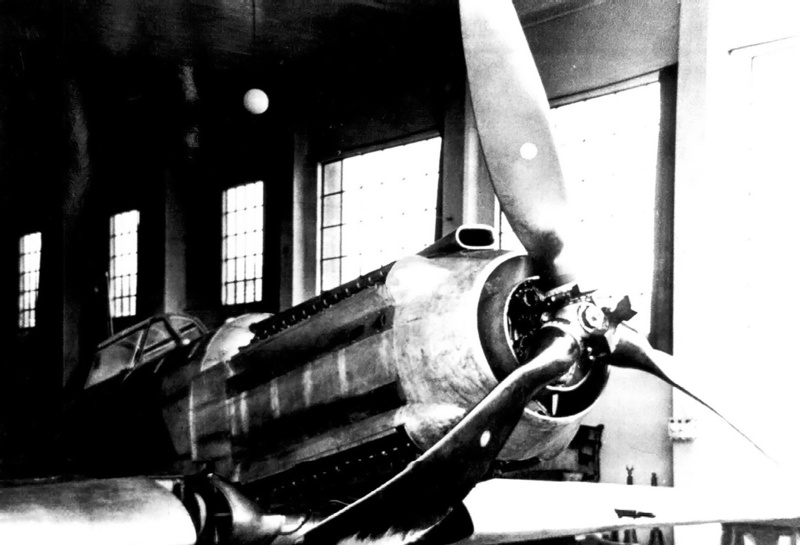 Progress on the Caproni Vizzola F.6MZ was delayed because of the engine. While the F.6M first flew in September 1941, it was not until 14 August 1943 that the F.6MZ took flight. The F.6MZ had a tight-fitting cowling that bulged around the engine’s four valve covers, and four rows of short exhaust stacks protruded from the cowling. Cooling air was taken in from around the spinner, and the air was expelled via an annular slot at the rear of the cowling. An oil cooler was housed in a chin radiator below the cowling. The F.6MZ was first flown on 14 August 1943. The two rows of exhaust stacks can be seen near the cylinder bank bulges. The cooling air exit flaps can just be seen at the rear of the cowling. First flown by Antonio Moda, the F.6MZ had an estimated top speed of 391 mph (630 km/h), some 37 mph (60 km/h) faster than the F.6M. This speed seems optimistic, considering the Zeta had an output of at least 225 hp (168 kW) less than the DB 605 and that the F.6MZ could not have produced significantly less drag or have been much lighter than the F.6M. The Zeta engine experienced overheating issues throughout the flight test program—the rear cylinders did not have sufficient airflow for proper cooling. Some modifications were made, but further flight tests were halted with Italy’s surrender on 8 September 1943. Two F.6MZ aircraft were ordered, but only the first prototype was built. In October 1941, Regia Aeronautica (Italian Royal Air Force) requested that Reggiane (Officine Meccaniche Reggiane) replace the DB 605 / FIAT RA 1050 in its RE 2005 Sagittario fighter with the IF Zeta RC24/60. Reggiane was another company owned by Caproni. The Zeta-powered aircraft, developed after the RE 2005, was the Reggiane RE 2004, and seven examples were ordered. Although Reggiane was less enthusiastic about the Zeta than Caproni Vizzola, they did work on designing a firewall-forward engine package. 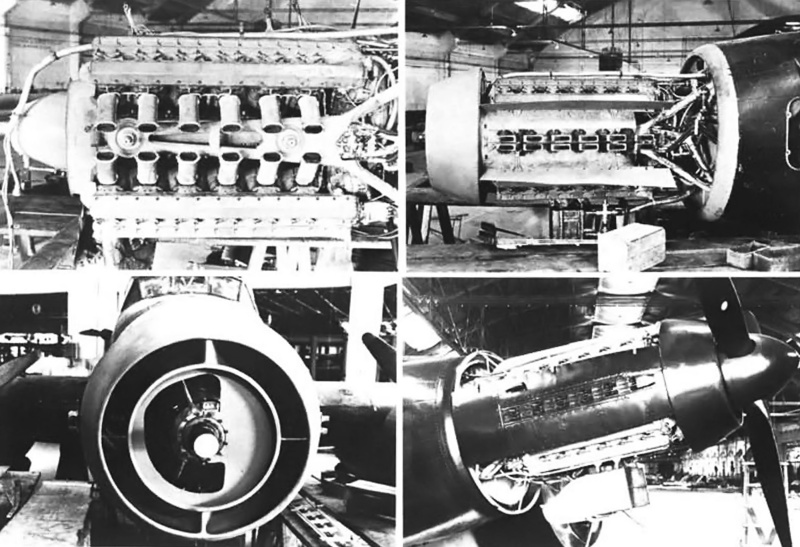 These four images show the Zeta RC24/60 engine installed in the nose of a SM.79. Once tested, this installation would be applied to the Reggiane RE 2004. Note how the exhaust stack arrangement was completely different from that used on the F.6MZ. A Zeta engine was not delivered to Reggiane until 1943. At the time, Reggiane was building Savoia-Marchetti SM.79 Sparviero three-engined bombers. One SM.79 was modified to have the Zeta engine installed in the nose position. This would enable the engine to be flight tested, and the cooling characteristics of the cowling configuration could be evaluated before the engine was used in the RE 2004. Compared to the F.6Z cowling, the Reggiane cowling had a larger diameter but was a cleaner design. Again, cooling air was brought in from around the spinner and exited through an annular slot at the rear of the cowling, and an oil cooler was positioned below the cowling. The Reggiane installation used exhaust stacks that ended with two close rows along the sides of the cowling. It appears that the Italian surrender occurred before the Zeta engine was ever flown in the SM.79. In fact, the Zeta RC24/60 was never cleared for flight, and the engine used in the SM.79 was most likely a mockup without all of its internal components. Although never built, the RE 2004 had an estimated top speed of 385 mph (620 km/h), 36 mph (58 km/h) slower than the RE 2005. At 7,117 lb (3,228 kg), the RE 2004 was 842 lb (382 kg) lighter than the RE 2005. IF also designed the Sigma, a larger X-24 engine using cylinders and other components from the inverted, V-12, air-cooled Delta. The Sigma had a 5.20 in (132 mm) bore and 6.30 in (160 mm) stroke. The engine displaced 3,207 cu in (52.5 L) and had an estimated output of 1,578 hp (1,178 kW) at 2,400 rpm. The Sigma was never built, but its approximate dimensions were 82 in (2.08 m) long, and 45 in (1.15 m) wide and tall. The engine weighed around 2,160 lb (980 kg). The Zeta installation for the RE 2004 (as seen on the SM.79) was fairly clean but somewhat spoiled by the large oil cooler under the cowling. Note the cooling air exit gap at the rear of the cowling. This entry was posted in Aircraft Engines, World War II on 5 June 2017 by William Pearce. Excelente report on this rarity, i always amaze of the italian “Engine troubles” for aircraft during ww2. Thanks.